Country Joe and the Fish were the wittiest, most political and most reflective of the San Francisco 'acid' rock bands. The band's radicalism emanated mainly from Country Joe McDonald, who was born of leftish parents in El Monte, Caiifornia in 1942. His Christian name, Joe, was apparently after Joseph Stalin. Musically, his main influences were country and he wrote his first song I Seen A Rocket in support of a colleague's campaign for student presidency. In 1964 he made The Goodbye Blues (his first recording) with Blair Harriman. His first group was The Berkeley String Quartet. Then, with Barry Melton and Bruce Barthol he played in the 13-strong Instant Action Jug Band. The Rag Baby EPs were the first recordings credited to Country Joe and the Fish. They were released in 1965 on the Rag Baby label, Rag Baby was a left wing pamphlet magazine. The group, which was based in Berkeley, eventually developed and recorded their superb debut album Electric Music For The Mind And Body. Written to trip to, this was one of the classic albums of the period and contained a broad range of material. There was Not So Sweet Martha Lorraine, a song of social satire, drug songs like Flying High, Bass Strings and Section 43, a daring political skit Superbird and the closing love song Grace (presumably about Grace Slick of The Jefferson Airplane) was full of acid-inspired lyrics. Country Joe left The Fish after this album, getting married and recording a solo album. Barry Melton kept the band together either as The Fish or The Incredible Fish and individual band members wrote their own material. The band reformed a few months later as The Country Joe and The Fish Revue. Although nowhere near as good as their first two albums Together, which included the results of their individual enterprise still has some fine moments notably on An Untitled Protest- another anti-Vietnam protest song and The Streets Of Your Town and Bright Suburban Mr and Mrs Clean Machine which were both protests against their own environment. McDonald is still credited as one of the band on the album sleeve and he appeared on some of the tracks. During 1968 these were extensive personnel changes and as a result Here We Are Again was disappointing. They appeared at the Woodstock Festival on 21-24 August 1969, with a modified line-up, and performed their infamous Fish Cheer, but only McDonald and Melton now remained from their definitive line-up. They also appeared in Michael Wadleigh's full length movie of the festival in 1970. The same line-up recorded their CJ Fish album. After this the band disintegrated. Briefly in the mid-seventies the whole 1967 line-up reformed for a series of live gigs and the disappointing Reunion album. Barry Melton later recorded an album with Melton, Levy and The Dey Brothers. We're The Crackers and All I Need which don't seem to appear elsewhere are on the Zachariah soundtrack LP. Death Sound Blues from 1968 can be found on California Christmas, Vol. 1. 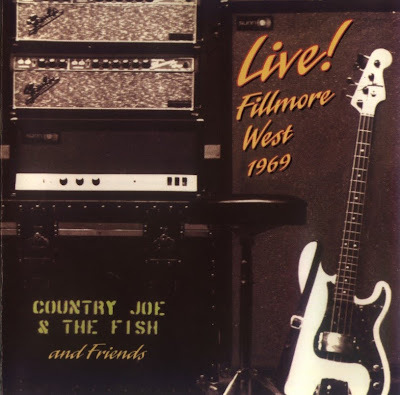 Country Joe and the Fish were one of the best and most interesting of the late sixties San Francisco rock bands. Their first two albums remain classics of the genre. Thanks, I'll upgrade sound quality with this post.